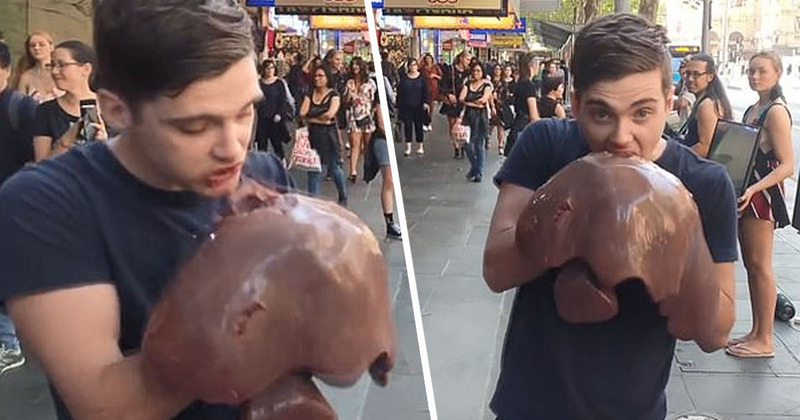 Two men crashed a vegan activist group in Melbourne, Australia, eating raw liver in front of them in protest, and saying veganism ‘makes people malnourished’. The strange protest was filmed while vegan activists stood on the street holding TV screens playing footage of animal cruelty. The protesters protesting a protest then proceeded to eat chunks out of a massive raw liver, the red blood gruesomely spreading across their hands and faces. Even as a non-vegan, it’s pretty disgusting to watch. As the two men chomp into to the liver, one vegan can be heard saying: ‘You look really proud of yourself’. To which the meat-eater replies: ‘I am proud’. A tense discussion then follows, as more and more people become involved and more and more phones film the incident. One vegan asks why they have to bring violence to a peaceful protest, as killing an animal in order to eat its liver can be seen as a violent act. While, when another vegan person asks why the men felt the need to eat the meat, one of them says: ‘Because you guys are making people malnourished’. So, maybe offer the meat to a malnourished person? Don’t hog it all yourself mate! During the kerfuffle, one meat-eater voices his support for the protesters, saying: ‘I think what you’re doing is awesome. The fact that you’ve got the guts to be here to show your perspective, I think it’s awesome.’ It’s not clear whether his brilliant pun was intended or not. Another interesting side-discussion occurs when a meat-eating protester asks a man about his opinions on breast milk, and whether he considers babies consuming human breast milk vegan or not, ‘because it comes from an animal’, he says. When the vegan suggests babies can still be vegan while still having their mother’s breast milk, the meat-eater behind the camera calls it ‘a conflict of your paradigm’. A spokesperson for Animal Activist Collective told the MailOnline about the demonstration, saying they received a tip-off that the protest might happen. They were encouraged to do this by a YouTuber by the name of ‘sv3rige’ which they follow as though his word is gospel. These ‘ex vegans’ usually then go on to blame a plant based diet based on their misguided idea of what a healthy vegan diet is and end up taking things to an even more extreme.